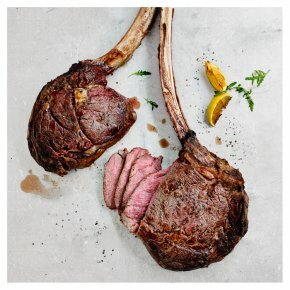 2 Tomahawk steaks taken from the rib, with the bone left in to ensure great flavour. Great on the barbecue, these also make for an eye-catching centrepiece to a dinner party. Waitrose beef is sourced from a carefully chosen group of British farmers. We have worked exclusively with many of our farmers for more than 10 years, so they understand and share our values and are committed to our high standards of quality, food safety and animal welfare.